The principal of a government pre-university college in Chitradurga has been suspended for allegedly sexually abusing a girl student. 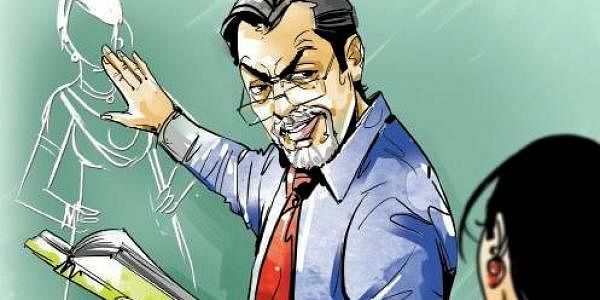 BENGALURU: The principal of a government pre-university college in Chitradurga has been suspended for allegedly sexually abusing a girl student. Following the directions given by State Primary and Secondary Education Minister Tanveer Sait, Additional Secretary of Education Department K Narayana issued an order suspending Nagaraj, principal of Government Girls PU College, Chitradurga, on charges of sexual assault. The order was issued on February 20 after a preliminary inquiry conducted by the department. The department had constituted an inquiry committee headed by Deputy Director of PUE Department Meera. The panel has been asked to submit a report within 30 days. According to highly-placed department sources, Minister Sait had received an anonymous letter from a girl who claimed that she was sexually assaulted by her college principal during an educational trip to Chennai. She added that he had taken her photographs in his phone. Sources added that the girl also claimed to be pregnant. The committee is conducting a detailed inquiry into this. After receiving the letter, Sait asked the department officials to conduct a preliminary inquiry which prima facie proved a case and issued an order suspending him. However, no police complaint has been filed yet.